Last night, I interviewed Gerry Adams for the third time. The first occasion was over twenty years ago, when I was making a light-hearted radio documentary for the BBC and Gerry agreed to be part of it. Two things struck me then: how hard he was working and his unassuming manner. I was doing newspaper reviews on Radio Ulster/Raidio Uladh’s Good Morning Ulster at the time, and he said he enjoyed mine but had a lesser opinion of another newspaper reviewer who will remain anonymous. Being the bottomless pit of vanity and insecurity that I am, I was pleased. The second time was for my book Martin McGuinness: The Man I Knew. That was in April last year and I asked him for 30 minutes of his time. He gave me over an hour, and if you want to know more about the interview, buy the book. Failing that, contact me and I’ll get you a copy. 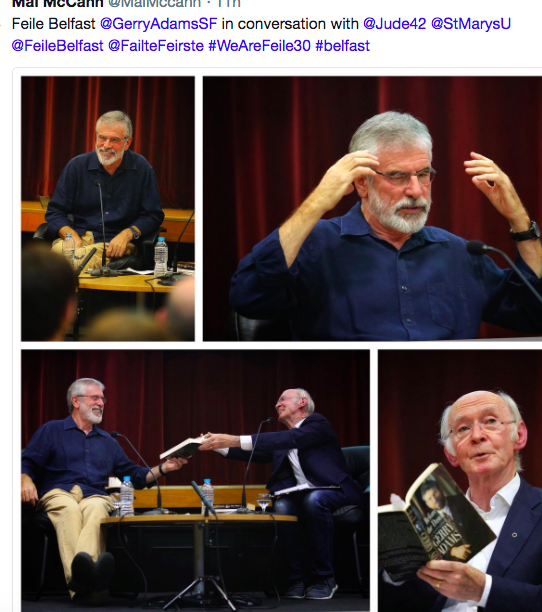 The third time was last night in St Mary’s University College on the Falls Road. The interview was about his writings- he has, I was astonished to discover, written some fifteen books. I asked him how in God’s name he’d found time to write them: his answer was that the books extend over a 36-year period, he found the act of writing therapeutic, and as a fiddler likes to play or a dancer to dance, he likes to write. The factual political stuff – his detailed accounts of the labyrinthine negotiations that ended with the Good Friday Agreement – he saw as an act of historical archiving of events from a republican perspective. Twenty minutes into the interview he told me – and the audience – that this was the nicest interview he’d ever had, and before my usual vanity/insecurity could kick in, I felt briefly anxious. Was I soft-pedalling? Holding back from more verbal rough-and-tumble? Then I remembered that we were here to discuss his writing, not his politics, and besides, maybe a nice interview now would do a tiny bit to counter-balance the mountain of hostile interviews he’s had over the years, including but not starting with Gay Byrne’s famous and foolish attempt to destroy him on The Late Late Show. Occasionally the discussion strayed into the Troubles. In Before The Dawn, I think it is, he describes a beating he received from the British army when taken in for interrogation. It’s chilling in its detail and the length of time it went on, and yet it’s got a detached, factual tone to it. Underplayed. I pointed this out and suggested it was surprising. Had it been me, my hatred of those who had beaten me would have crackled from every line of description. For some people, Gerry Adams will always be reviled and detested as the epitome of violent republicanism. For others, he’s thoughtful, quiet-spoken and perhaps the outstanding figure in Irish political history over the past fifty years. He’s also a gifted and funny writer. I enjoyed last night. Judging by the audience’s total focus throughout the near-90 minute interview, so did the audience. Footnote: I see The Irish Times this morning reports on the event and headlines the fact that Gerry plans to publish The Negotiator’s Cook Book – dishes which nourished and sustained the republican negotiators during the talks. The Irish Times could have headlined Gerry’s comments on republican-Catholic Church relations during the Troubles, or on that beating, or on his motivation for writing fiction. But it chose the cook book. Worse still, it said that I was an Irish News columnist. I shall, naturally, sue.